Make learning multiplication a little bit more fun for your learners with these Horse-Themed Array Cards with Matching Worksheets! Included are 12 cards with numbers 1-12 along with 3 recording worksheets! Arrays help students to visualize multiplication and break it down into easier, more manageable parts. There are many other array cards to check out from FHD! 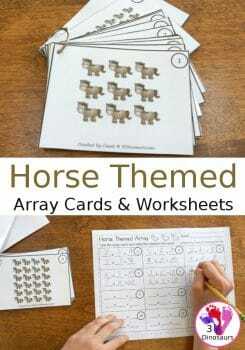 Grab these Horse-Themed Array Cards with Matching Worksheets!